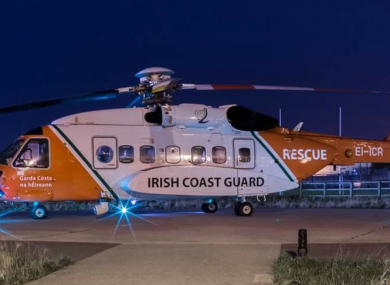 A REPORT BY air accident investigators into the Rescue 116 tragedy has recommended that a “thorough review” should be carried out into all air search and rescue operations in Ireland. The report was published today – just days after the first anniversary of the crash that claimed the lives of four Irish Coast Guard crew, marked by a ceremony at Blacksod in Co Mayo. Captain Dara Fitzpatrick, Captain Mark Duffy, winchman Ciarán Smith and winch operator Paul Ormsby all lost their lives after Irish Coast Guard helicopter Rescue 116 went down off the Mayo coast last year. A preliminary report previously published by AAIU found that Rescue 116 hit Black Rock island before crashing. It also found that the island wasn’t registered on the crew’s internal mapping system. An interim report by the Air Accident Investigation Unit Ireland (AAIU) has made three further recommendations today. The Minister for Transport, Tourism and Sport, as the issuing authority for the Irish National Maritime Search and Rescue Framework, should carry out a thorough review of search and rescue aviation operations in Ireland to ensure that there are appropriate processes, resources and personnel in place to provide effective, continuous, comprehensive and independent oversight of all aspects of these operations. This latest report identifies a problem with the “coarseness of the latitude and longitude position information recorded” on the flight data recorder. The Sikorsky Aircraft Corporation should make the necessary updates/modifications to the S-92A helicopter to ensure that the latitude and longitude information recorded on the Flight Data Recorder reflects the most accurate position information available during all flight regimes and mission profiles. CHCI, with external input, should conduct a review of its SMS and ensure that the design of its processes and procedural adherence are sufficiently robust to maximise the safety dividend; this review should consider extant risk assessments and a thematic examination of the corpus of all safety information available to the Operator, both internally and externally. The investigators said that a digital video recorder capable of recording infrared images was recovered from the seabed, but no data was recovered from it. This examination is to enable the Investigation to develop the best possible understanding of the flight dynamics and structural disruption sequence associated with the accident. A large number of items, some of which were related to the accident helicopter, have been recovered sporadically from both sea and shoreline over the period since the accident. All recovered items were secured by An Garda Síochána at Belmullet Garda Station and are subject to consideration by the Investigation. The investigation is ongoing and a final report will be published in due course, the latest report says. Email “Rescue 116 crash: Investigators seek review of all Irish search and rescue operations”. Feedback on “Rescue 116 crash: Investigators seek review of all Irish search and rescue operations”.